Story telling dates back to the 17th Century or probably eons before, when appointed people would roam around the country “story telling” or “telling tales” to the folks who would listen as a form of idle entertainment. I have always enjoyed writing, so my storytelling comes from within. It is a personal expression or reflection on the way I view some of the everyday chronicles that occur in life. As a reader, there are often times when I wish I could enjoy the freedom of being able to pick up a book and read a few pages to get a complete story. This is what this book is all about. This book contains the gentle ramblings of short stories and words, both funny and sad that I have been able to place onto paper. When it all began, is hard to say. When it will ever stop… I hope never. 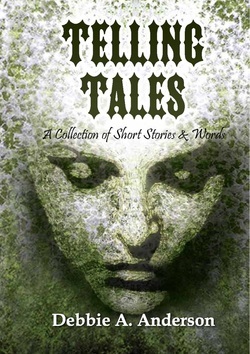 Cover Design by artist Heather Brewster and words and stories written by author Debbie A. Anderson. Printed on high quality paper , 5 x 7 inches in size. Paperback book glossy cover.